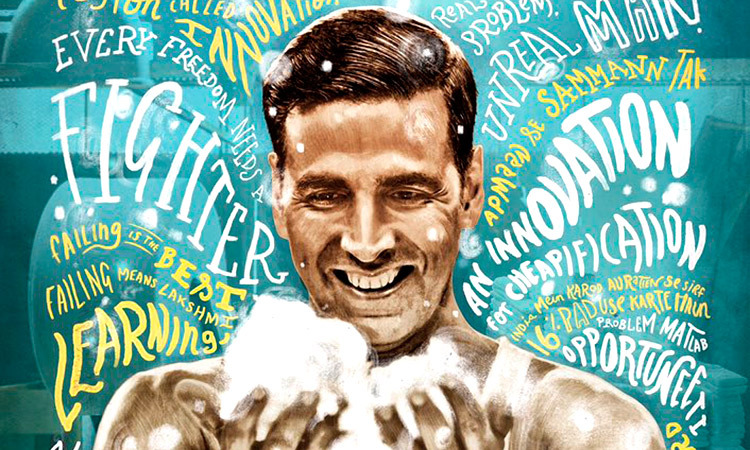 Akshay Kumar for long has been championing social and nationalist causes in his films with TOILET: EK PREM KATHA, AIRLIFT, JOLLY LLB 2, HOLIDAY, BABY, NAAM SHABANA, among others. It would be safe to say that the actor has carved his niche with integrating pertinent issues in commercial cinema space, leading to few of his detractors limiting him to that particular category. 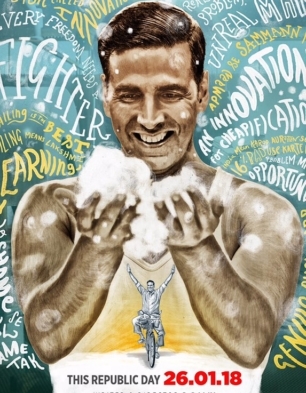 Akshay, who also is one of the most bankable stars in the business currently, returns to the big screen with R Balki’s PAD MAN based on the issues, relating to menstruation, faced by underprivileged women in rural India. The film is produced by Twinkle Khanna’s Mrs Funnybones Movies and has Sonam Kapoor and Radhika Apte in lead roles along with Kumar. So yes, with all this hoopla around PAD MAN, it is only logical to expect a lot from the film. Does it meet our collective expectations? Read on to find that out. We have you covered. The film revolves around life of Lakshmikant Chauhan (Akshay Kumar) based out of a village in Madhya Pradesh and his inspiring journey of spreading awareness about menstruation and smashing taboos associated with it in the conservative society. Now, first of all let us all agree that it was indeed brave of Akshay to touch upon this subject, given his massy appeal. There is a probability that aam junta might shy away from watching the film because of its unconventional content. But the makers have made sure that there is enough publicity going around which will make people shun their ignorance and embrace this cause wholeheartedly. So, a newly married Lakshmi is a welder but extremely curious about female menstruation and is disturbed by the lack of sanitation or awareness around it. It all starts when he finds out that his wife Gayatri (Radhika Apte) uses dirty cotton cloth for the lack of sanitary pads during her periods. He then fashions a cotton pad and persuades his wife to use the same. Despite repeated attempts, he fails to make a sustainable napkin. His relentless pursuit to make the perfect sanitary napkin leads his entire family to disown him until he manages to convince the society that menstrual hygiene is a burning topic which needs to be addressed. Akshay Kumar is at his natural best in the garb of a village bumpkin Lakshmi. The supporting cast of Radhika Apte, Mrunmayee Gokhale and Jyoti Subhash are brilliant, complementing his performance. The first half is filled with a lot of bittersweet moments between Akshay and Radhika but one scene that stood out for us was just before the interval. Lakshmi, in an attempt to make a full proof napkin, attaches an animal blood pouch to his waist making the blood drip steadily into his handmade pad. Thinking that his job is done, he happily strides away only to realise to his dismay that the pad is leaking. The mere sight of Akshay taking a plunge into the nearby river with soiled pants is moving, impactful and breaks stereotypes in every way possible. It is indeed brave for a mainstream Hindi film hero to attempt something like this. The dialogues written by Swanand Kirkire and R. Balki are funny, emotional, bringing out a very earthy side of the lead hero. Though we felt that Lakshmi’s UN speech could have been shorter. In the second half, director R. Balki slips a little bit as the film gets too technical showing Lakshmi building a pad manufacturing machine from scratch. The editing treatment given to these bits by Chandan Arora could have been tighter. Also, Sonam Kapoor’s entry is a little too convenient and the way she begins her association with the PAD MAN Akshay is a tad bit filmy. Sonam tries to deliver an honest performance as a confidante and marketing guru to Akshay’s character but there is little focus on her in the movie. She however tries to make the best of what she has, engaging us for most part. Despite saying this, a love angle created by the makers between her and Akshay seemed forced and unnecessary. The screenplay (R. Balki) is quite engaging and entertaining. It sure drops at a few places but eventually manages to pick and keep you glued to the story. Since this film, which is inspired by the life of Tamil Nadu’s social entrepreneur Arunachalam Muruganantham, is adapted to suit North Indian sensibilities for greater viewership, PAD MAN is shot across scenic locales of Maheshwar, Indore and Mahu in Madhya Pradesh. PC Sreeram has done an excellent job with the cinematography. The camera work is beautiful and expansive capturing the simplicity of the lifestyle of the people living there. One finds a massy connect in the way characters are treated as far as their costumes, dialogues and overall appeal is considered. Amit Trivedi’s music is good but not spectacular, to be honest. Only two tracks ‘Aaj Se Teri’ and Pad Man title track stand out but then there is little scope for the music when the film is so heavy on content. It is worth mentioning here that Akshay Kumar manages to maintain perfect gravitas as a feminist icon who is emotional and passionate about his cause. It is indeed applause worthy for him to take a taboo topic (after TOILET: EK PREM KATHA) and make a commercial film out of it, without letting it get too preachy for its own good. Also, it is interesting to note that Balki’s gallery has always been the urbane multiplex going audience and yet he pleasantly surprises us by making a rooted film which has the potential to cut across class/caste barriers. On the whole, PAD MAN is a brave and an inspirational attempt at creating a commercial cinema out of a taboo topic. The movie scores high on content as well as emotions. At the box office, Akshay Kumar’s mass appeal will surely help to pull in the audiences. It has the potential to grow steadily at the box-office with the positive word-of-mouth. Period.